In 2015, it was recognized that gambling had become more prominent in Ohio, mostly due to the addition of 11 new casinos and racinos. With new exposure and access to gaming, Ohio realized that they now had to address a new public health issue effecting Ohioans: problem gambling. To address this issue, the state agency, Ohio for Responsible Gambling (ORG), launched a powerful two-year campaign that places a targeted emphasis on building awareness around gambling-related issues and drives families, professionals and other community groups to resources available to educate and assist with problem gambling education, prevention, treatment and recovery. 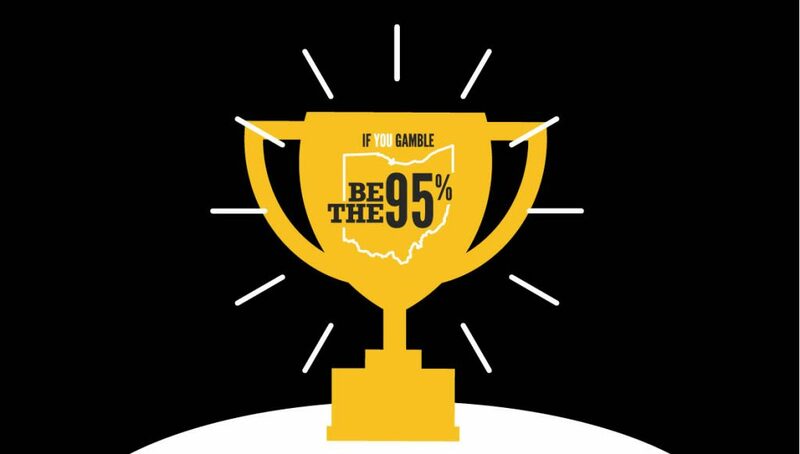 On October 4, 2015, ORG launched the “Be the 95%” campaign, which originates from Ohio Gambling Survey data that surmised, of Ohioans who gamble, 95% do so responsibly. 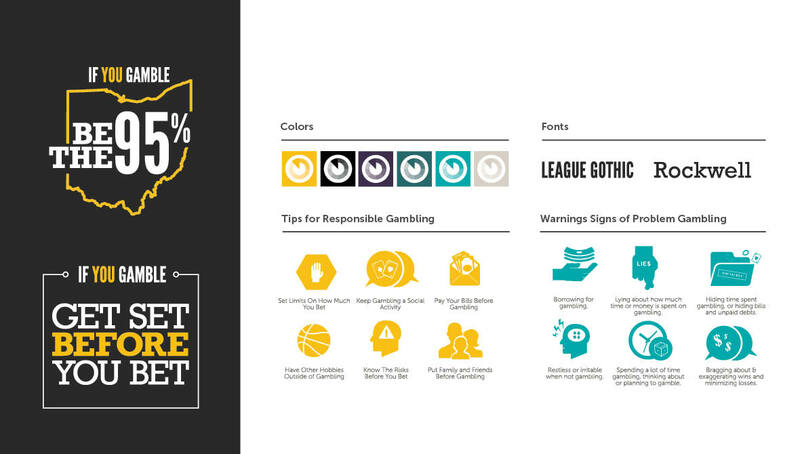 With the goal to drive behavioral change within the community, the campaign directs users to a microsite (https://www.beforeyoubet.org) that was developed to offer an online assessment, which gauges an individual’s risk of problem gambling, while offering free resources for help. Ohio’s “Be the 95%” campaign was such a success it won national recognition in its first year, winning all three campaign award categories at the 2016 National Council on Problem Gambling (NCPG) Conference in New York for Best Public Awareness Campaign, Best Website, and the People’s Choice Award, as well as a Silver Addy in the Responsive Web Design Category at the 2016 American Advertising Federation Awards (Columbus). TARGETED MEDIA PLAN: We helped to engage communities across the state in participating in our online assessment by launching an integrated media strategy (approx. $1 million each year in media buying), driving traffic to the microsite and online assessment through digital, social media, environmental, event, TV, and radio advertising. COMMUNITY ENGAGEMENT: To help aid in media efforts, an online toolkit was also developed, providing templates for print, digital, and video assets for statewide partners to use, utilizing their own local budgets to place media with our message in their community. GAMTALK INTEGRATION: As a third-party software, GamTalk is a community support forum that connects people whose lives have been affected by problem gambling. 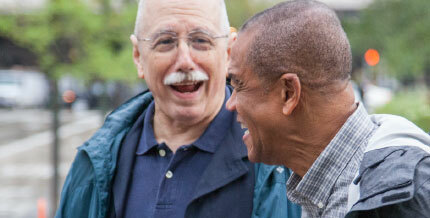 To help provide additional support for at-risk individuals, we integrated a link onto the homepage of the site, providing an additional option for problem gamblers to seek treatment and a channel for support. MICRO-CAMPAIGNS & COMMUNITY TOOLKITS: The community toolkit is a key part of the website, as it is dedicated to help provide community partners throughout the state of Ohio with customizable media assets that they can use to help spread the word on the campaign and problem gambling. In our second year, we specifically created educational toolkits for the following groups: Sports Toolkit, Youth Toolkit, Senior Toolkit, and a Spanish Toolkit. These tool kits were created based off requests from community partners and outreach programs in response to a need to address these demographics. RADIO SPONSORSHIPS: Partnering with 92.3 The Fan, we were able to sponsor Adam the Bull, the only FM sports talk station in Cleveland. This popular talk show host not only helped spread the word about the Be the 95% campaign and encouraged people to take the online quiz, but also shared his own story as a recovering gambling addict to help relate to fans and problem gamblers alike. His alignment to our mission was a huge success and gained great exposure and awareness. Through a variety of media tactics and grassroots efforts, this campaign continues to achieve groundbreaking results, generating over 140 million impressions from October of 2015 through June of 2017. Now, looking to Year 3, we are excited to continue to advocate for this important mission and look to engage new audiences across Ohio who can potentially be effected by problem gambling.